The HES Multi-family system supports two general types of hot water energy estimation, "central" and "unit". The most important distinction between them is that the central method requires the user to submit details regarding dishwasher, clothes washer and fixture usage, whereas the unit method is base on the number of occupants and typical water use per person estimates. 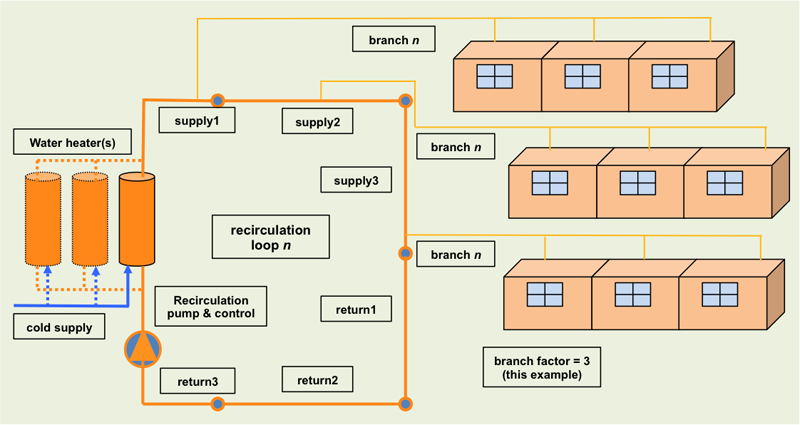 Below is a conceptual diagram of the multi-family domestic hot water calculation module showing the principal components: supply, equipment, and distribution. The details of the calculation method are described on the next page down, detailed calculations.